Denny Jump (Bellevue, WA, United States) on 16 June 2011 in Transportation and Portfolio. A rarely used rail line in Warren County, NJ winds into the mist of the early morning. Captured June 15, 2011. Always 'something' about a railroad track . . sets the mind off on a journey. 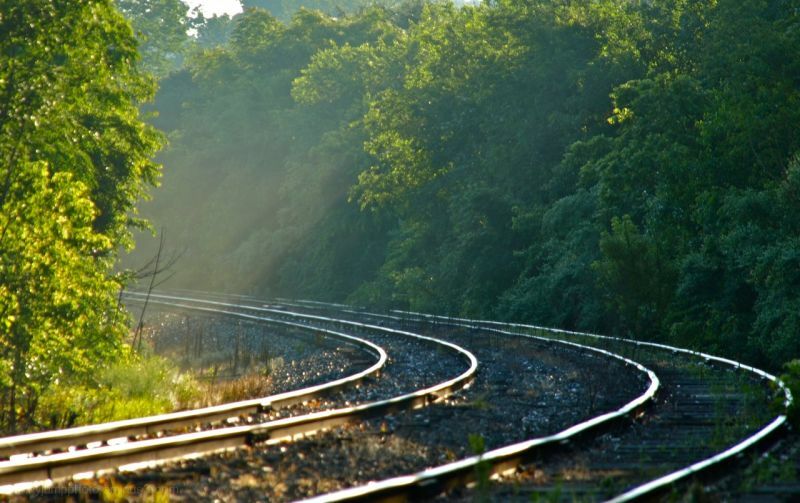 @Ronnie 2¢: Thanks Ronnie2 - I quite agree...rail tracks are hypnotic and evocative. My brothers and I all worked for the railroad in our town..the oldest brother just retired about 6 years ago after 40+ years, the middle brother joined later in his years, but even he has now worked there for almost 20 years, Being the youngest, I worked a few years when I was younger, but then in 1967 it was off to the Army, Vietnam, etc....but Railroad has always been in the heart! Superb shot, Denny - the rays of filtered light look stunning. Beautiful framing of the curve in the track - and the glint of light on the metal rails is a magic touch as well. @Stephen: Hi Stephen - Thank you so very much. I am definitely loving your series of late - tremendous job, sir! Beautiful light !!!!! Great picture indeed ! @DowsherVision: Thank you very much D. I really love your image for today - beautiful job!! Very beautiful, the glorious light and mist. @Phil David Morris 2011: Hi Phil - thank you very much! Denny this is a beautiful composition! Excellent study of light, lines and curves, they all work well and in harmony. @Ralph Jones: Thank you so much, Ralph! Your series on pride is fantastic...awesome portraits! I love this for so many reasons! The light is wonderful- I love the way those tracks just glow- and the composition is just excellent! @Tracy: Hi Tracy - Thank you...I meant to tell you that I signed on to the California Parks initiative a few weeks ago - Even though I don't live there now, after spending almost 40 of my 63 years in the State, I have always considered myself a Californian and we often visited and camped at various Stet Parks...So I will certainly do what I can from afar. Thank you for putting that up! Great shot! The light is beautiful. You wonder what could be just around the corner! This is a lovely composition! I like the mood, the light, the rails. the light is just perfect! @Olivier: Hi Olivier - Thank you verymuch sir. I really appreciate your kind rematk! I love the rays of light streaming across the tracks - a real sense of adventure and journey in this image - love it! @Nigel: Hi Nigel - Thank you so very much! beautiful photo! wonderful light and very nice composition with the glowing tracks curving away into the distance! @DarkElf: Hi DarkElf! Thank you so very much - I really appreciate your kind remark...railroad tracks, mist and sunrise....I love them all ;-) Thanks again sincerely! This is a superbly composed image, Denny, with a light & curves to die for ! This is a fantastic atmosphere the one portrayed in your image, Denny***** Superb. I love the glint light of light on the rails. Those rails must get some use since they don't seem to be rusted on top. Wonder what is around the bend??? Nice!